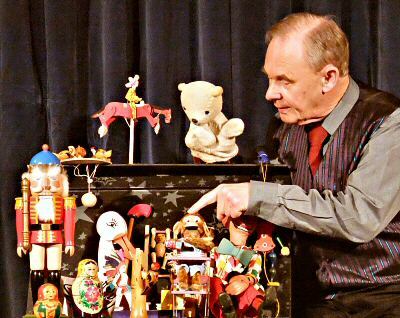 Chris also collects Historical and Mechanical Toys and has prepared a schools workshop in which he demonstrates a plethora of toys from his collection. This can be angled towards a "playthings of the past" or a technology project illustrating movement using the lever, pivot and pendulum. The children love to handle the toys themselves and explore their action. Puppets, another form of moving toy, come in many forms. Chris demonstrates glove and hand puppets, rod puppets and stringed marionettes and suggests ways for the children to make make simplified versions for themselves. He shows how each type of puppet is brought to life and the different types of manipulation illustrated. 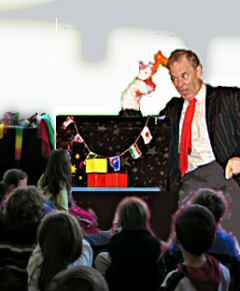 The children try the puppets for themselves. This versatile workshop has been successfully employed with Years 5 & 6 for their DT project while at the same time being one of Chris's most popular presentations for Infant and Reception children. It can be angled to a history of toys, or to simulate ideas about the way toys work, or towards a study of suitability and comparison of materials and textures. Chris has a knack of simplifying or elaborating according to the age of the children, and all the time communicates his own enjoyment of the play element which is of course at the heart of the toy.